The gardens are generally looking fine. Though frankly if they didn’t during June, I might as well give up and get a proper job. But the Kidney Beds are in dire need of a major revamp. They were cobbled together five years ago with a few sitting tenants, some plants from my garden, gifts from friends and impulse buys. I’ve added all sorts of ‘stuff’ since then. 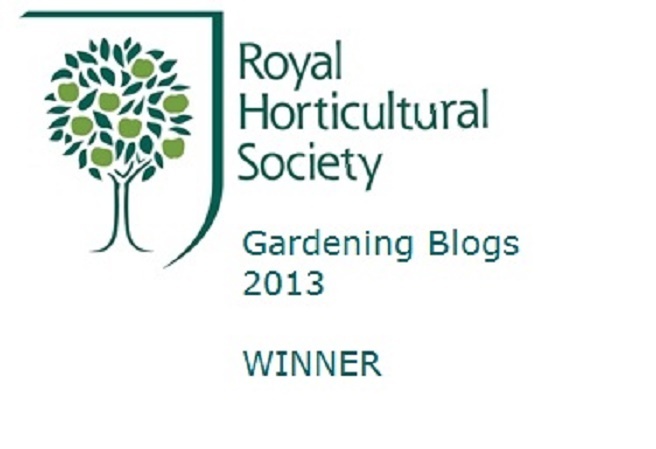 And I have been fairly pleased with how they’ve performed whilst I concentrated on other parts of the garden. But (and yes, I say it every year) their time has come: in the autumn I am going to strip them out, simplify and replant. And the same goes for you, Long Borders. I now have enough mature, bulky plants to make a bolder, less bitty design and give space to swamped, under-performers. In the early days, my main concern was filling bare soil but now I’m looking forward to a full frontal assault on all four borders with digging-fork, spade, mattock, bow-saw and grin. 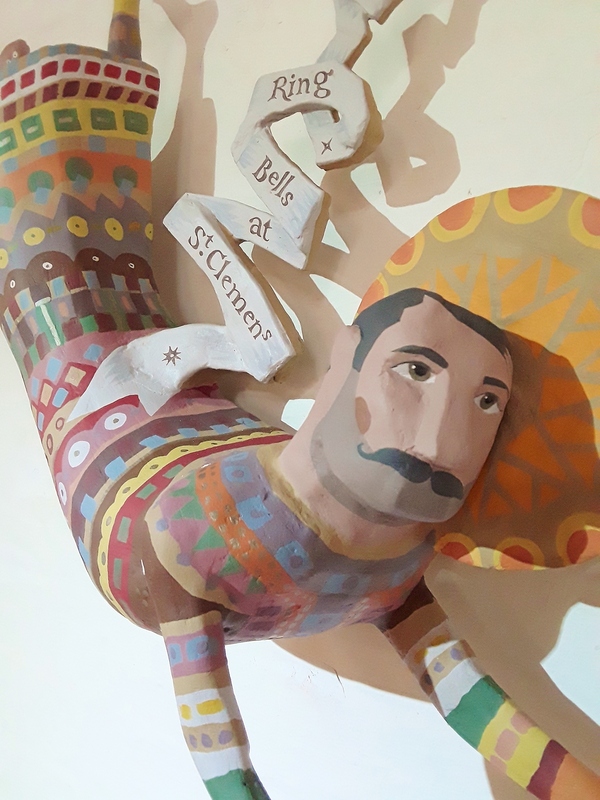 During June the Tropical Border gets under way. 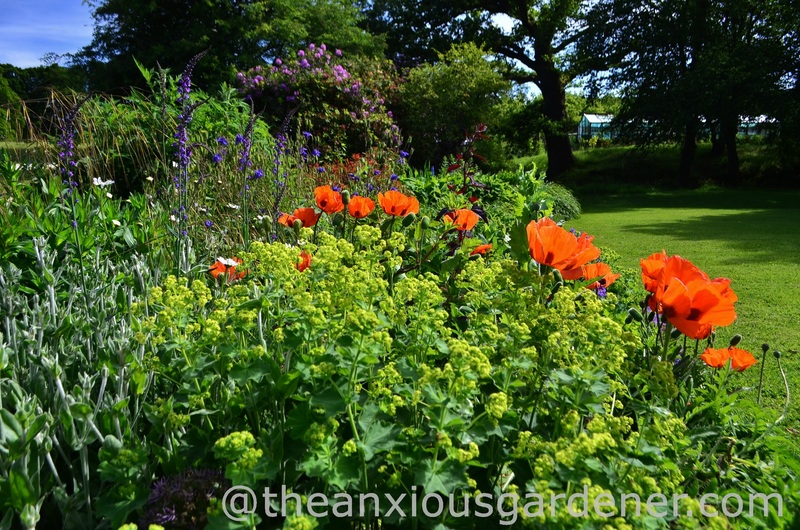 And this is a border which I did plan and plant from scratch – and that I really enjoyed. 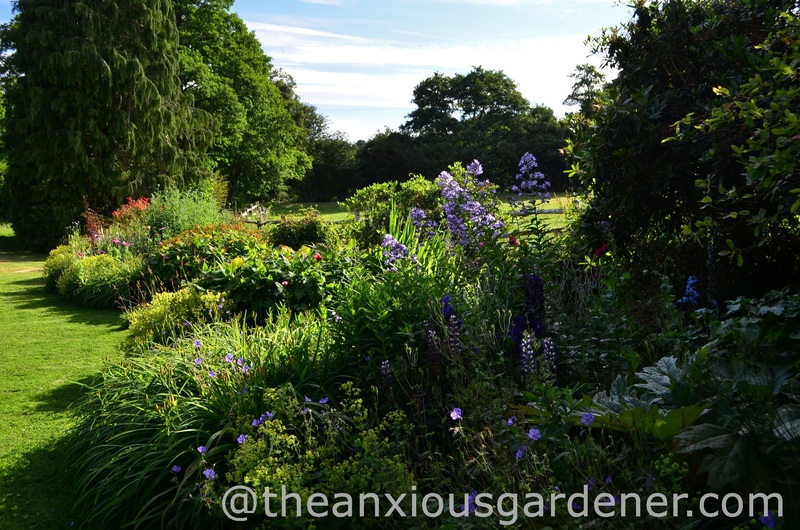 I’ll do a post later in the summer on how it has developed this year; which plants I’ve added … and which I’ve deleted. 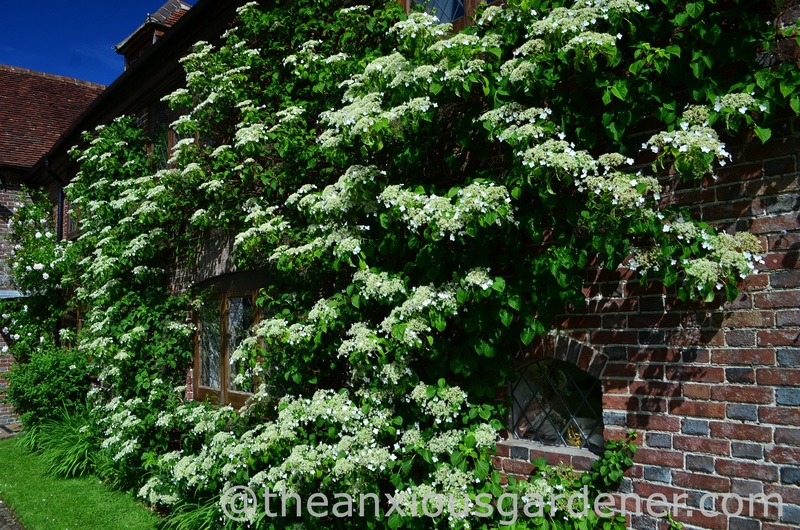 Some plants in the garden don’t need much attention; the Hydrangea petiolaris on the front wall of the house for example. I deadhead it (a little), cut growth creeping over windows and into the roof but otherwise leave it to its own slow devices. I have no idea what it is – looks rather like something Quatermass would have unearthed: an inspiration for H R Giger’s Alien. I was fascinated and especially so by the larva leaping about like a Mexican jumping bean. 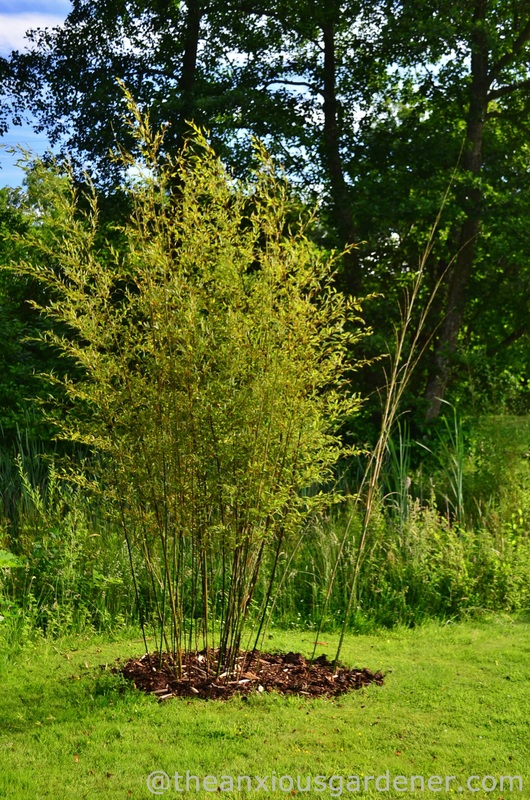 I fed and re-mulched the bamboo and happily counted 20 new canes – normally it produces a dozen. (The new canes are green but gradually darken to black over the course of a year). 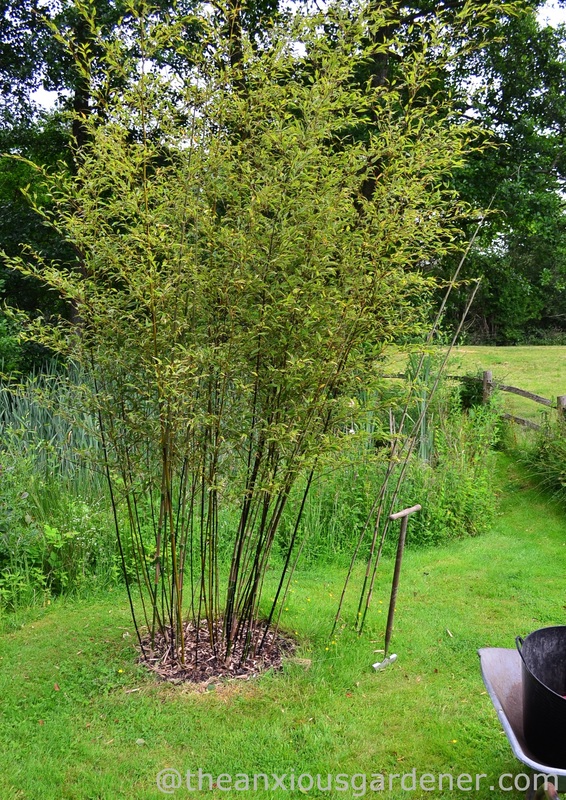 I remove thinner, older canes as new, thicker ones grow and strip off the lower leaves to show-off the black. 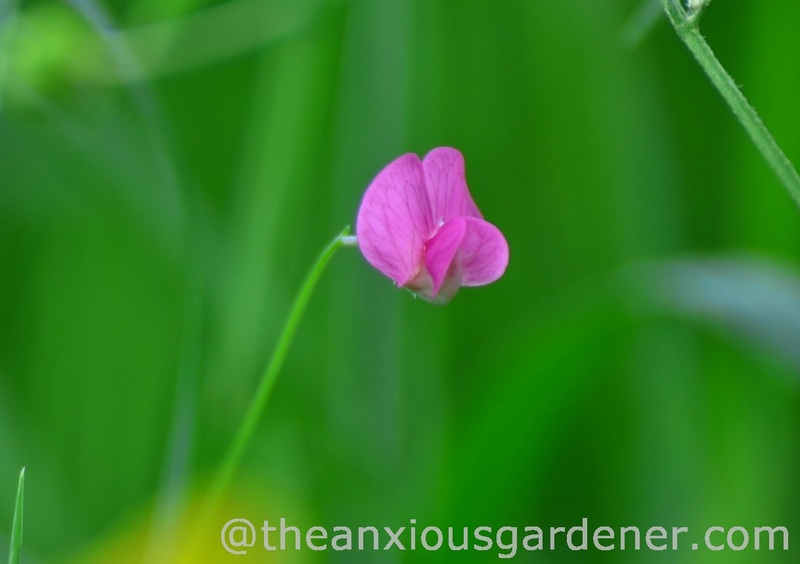 I haven’t seen grass vetchling (Lathyrus nissolia) on the meadow since 2011 – though I look every year. In early June it was back in several large-ish patches. I think it perfect. 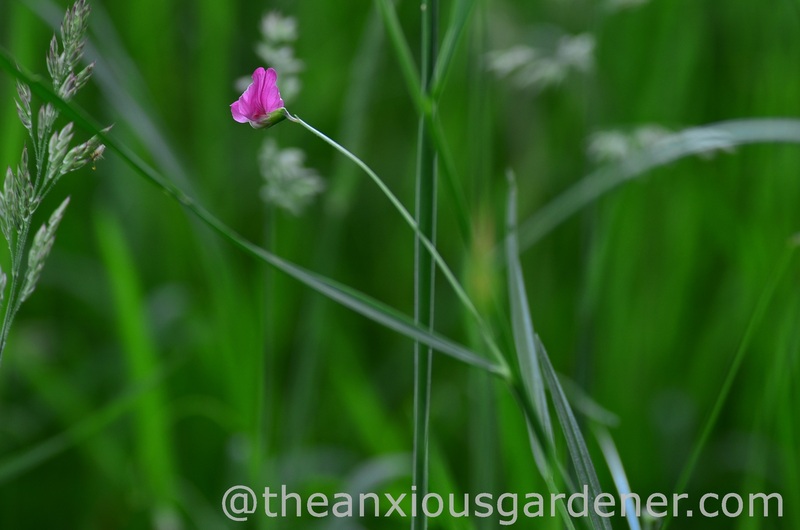 And it does grow from what looks like grass, rather than the usual pea-like vetch leaves – hence its name. And does anyone know what this is? I’ve tried and failed to identify it. It appeared in un-mown grass by the greenhouses. Grass grows so very quickly during May and June that mowing seems endless. Actually, no mowing is endless. But Hallelujah! The recent lack of rain has finally put a stop to that inch of new growth every few days. 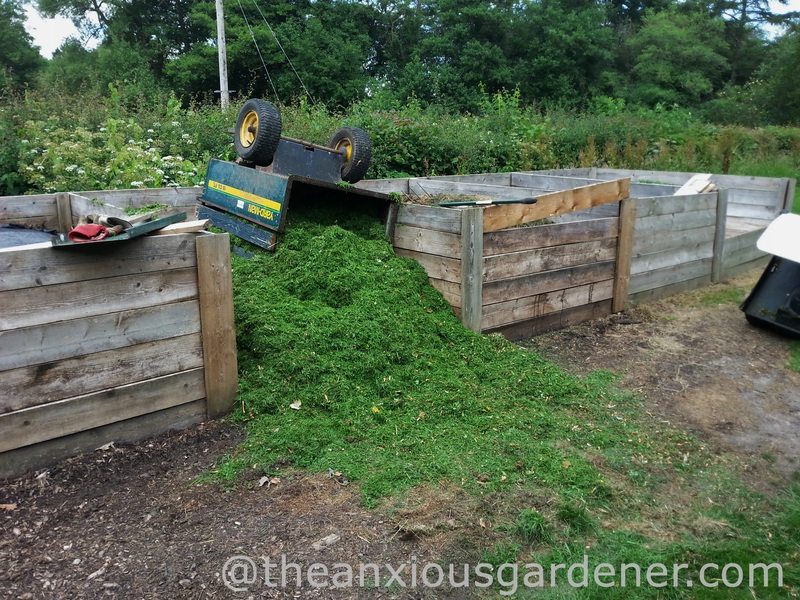 Mowing is hard, hot and pretty boring work – my method of emptying the trailer into the compost bins doesn’t make it any easier. That full trailer is very heavy to tip over and I can have five or six to empty a day. (I save a pretty penny on gym fees). Mowing operations are slowed and interrupted by languid bumbles and distracted honey bees. (I can’t mow a bee; call me old-fashioned). I stop and nudge them gently with the front of the mower, so entranced are they by flowering clover. 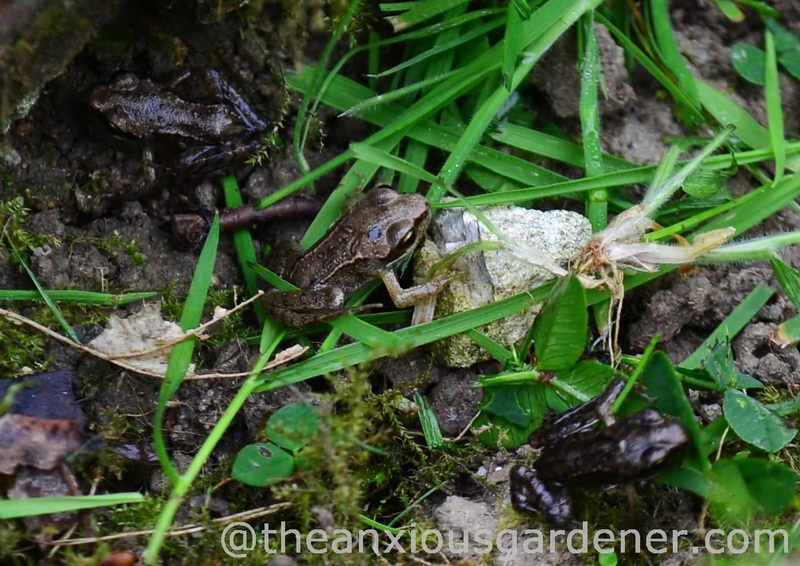 But what has truly slowed grass-cutting down this year are froglets. Dozens upon dozens of them – and they’re just the ones I notice. I reckon there must be thousands, especially in the meadow and along the pond fringes and ditches where the grass is damper. As I mow, or even just walk about, they hop about my approaching feet or wheels – like miniature firecrackers. 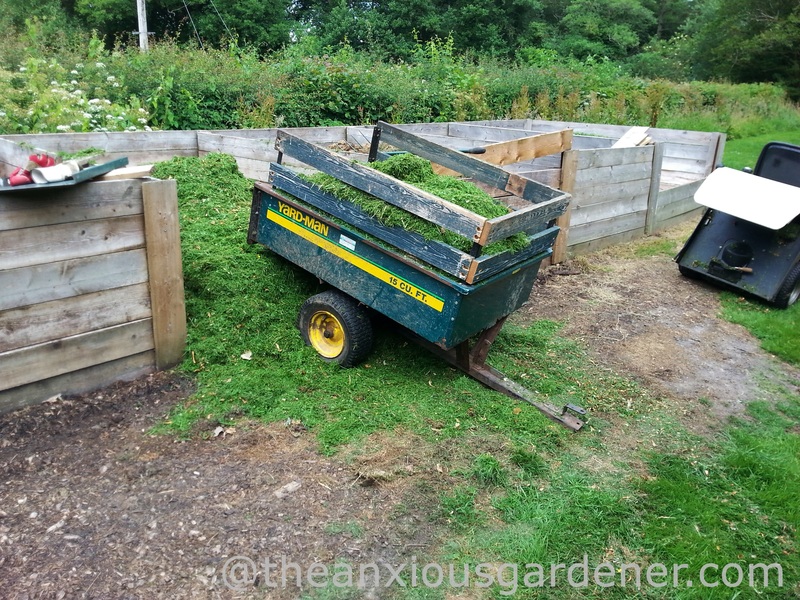 But often they don’t actually get out of my way and again I stop the mower, gather them up or shoo them them safely to one side. (I can’t mow a frog: call me old-fashioned). Here’s a small gang I disturbed when lawn-edging. I’ve started harvesting new potatoes, cucumbers, sprouting broccoli, salad leaves and radishes. But the Priory’s bumper crop this year is froglets. 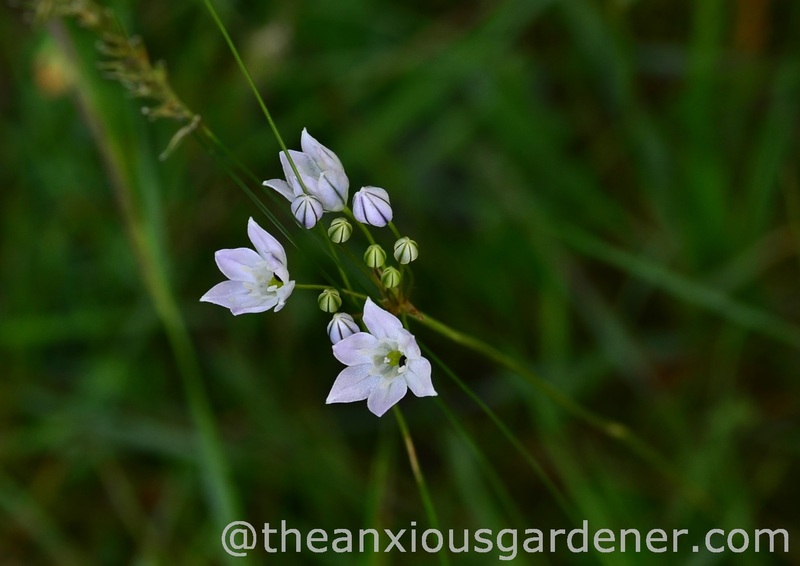 * Thanks to Fraser – @insightofseed – and Frank at Bittster who both suggested triteleia and a quick on-line image search confirms that it is. 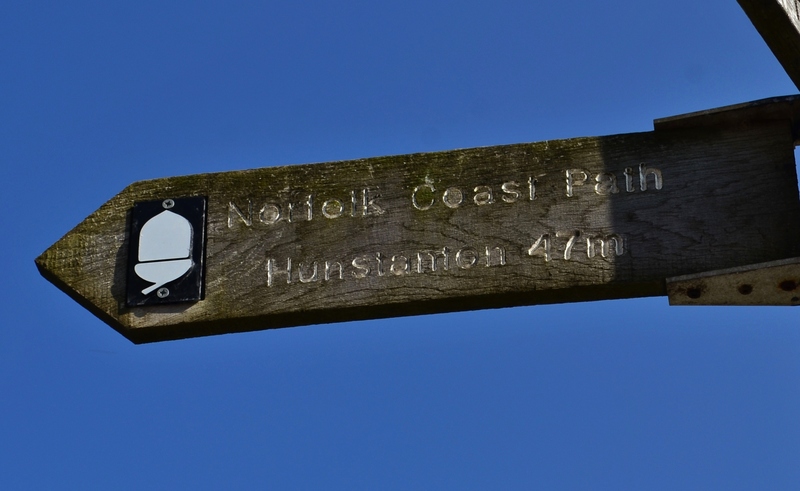 It’s also called Fool’s Onion – now then, who suggested it might be an allium? 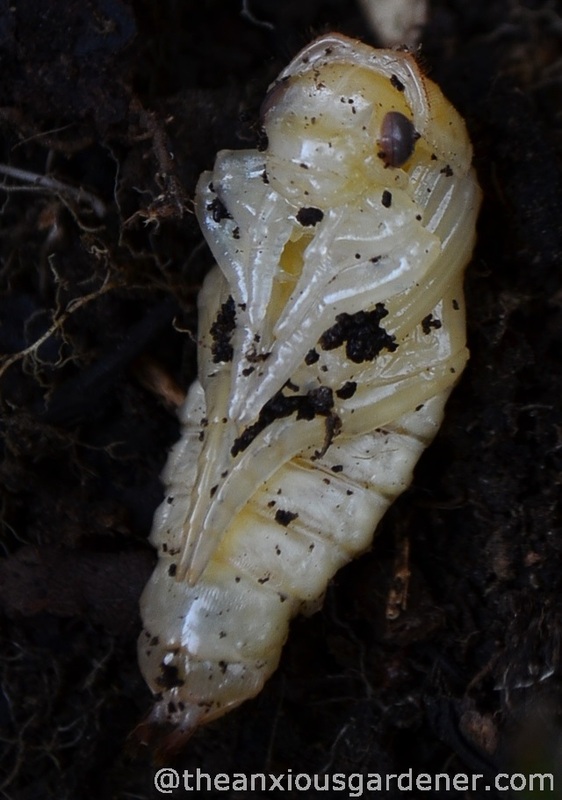 ** And thanks also for your suggestions in helping to identify the larva (though actually I realise now it is a pupa). I think it is a great diving beetle. Unless you know different. Hello Janet, yes I think a little Lark Ascending will reign in any heady excess and calm the mad gleam in my eye. A bit. Mattocks aren’t exactly precision tools, are they? I wish I still had a plant stall outside my house – so many perfectly fine (and big) plants end up on the compost or bonfire because I no longer have a use for them or I’ve just fickly tired of them (yes, Nepeta Six Hills Giant – I mean you). Dave. That has to be the biggest climbing hydrangea that I’ve ever seen. It’s a beauty too. I don’t envy your re-doing the beds. I have to do the same here and I’ve been putting it off for too long. That tropical border was an excellent idea. I think it looks great! Flamin’ Eck! 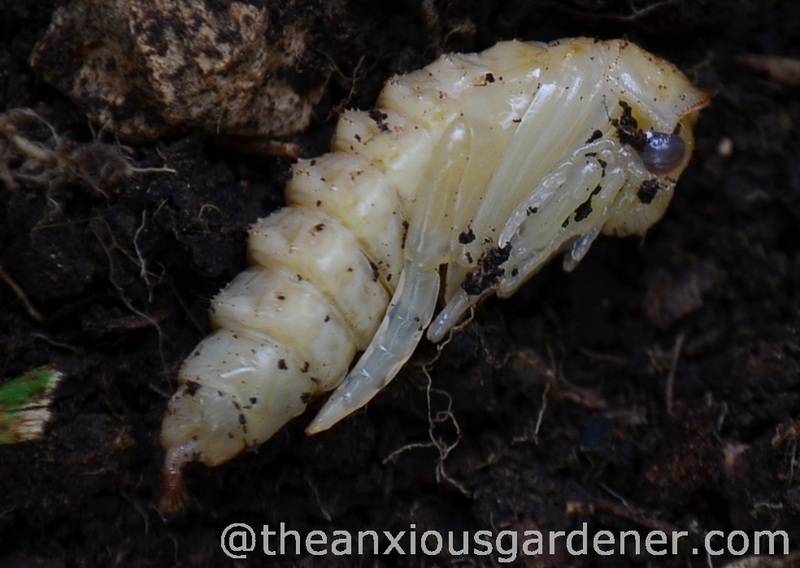 It’s 23.57pm…I was just off to bed when I thought I ought to check out what you’ve been up to ….and now I’m gonna have nightmares about hideous white, ghostly critters eating me alive as I snooze. Thanks a bunch! 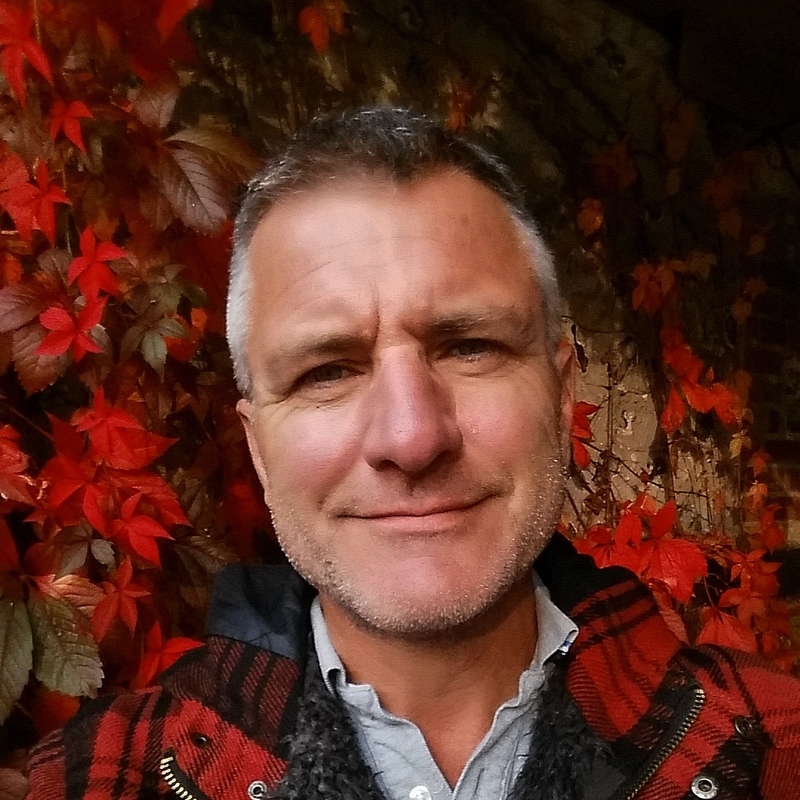 Fantastic blog as usual Dave! You make my nights a little brighter with your great posts! Wow, what a beautiful garden, nice shots, thank you so much for sharing. You do have an amazing space to work with and you have some wonderful plants to start this project. I love the Hydrangea petiolaris on the front wall of the house. 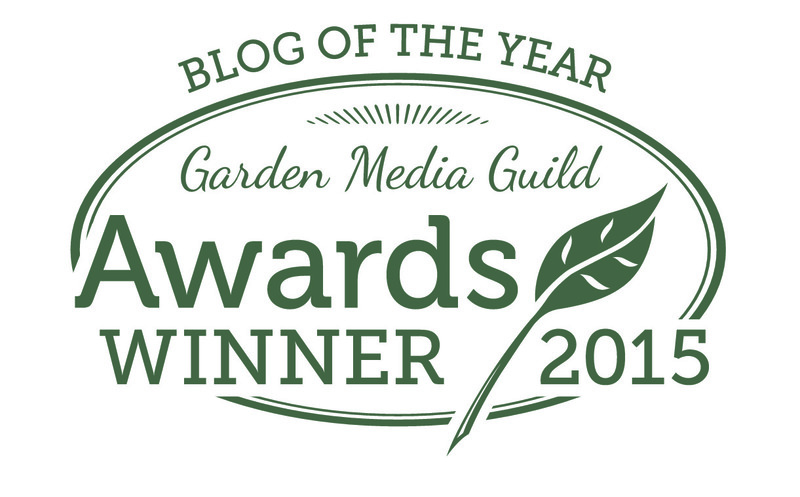 Beautiful photos and the gardens look great. I’d be wary of the beastie though, I’m sure she’s biding her time and recruiting her minions for a mid summer assault. 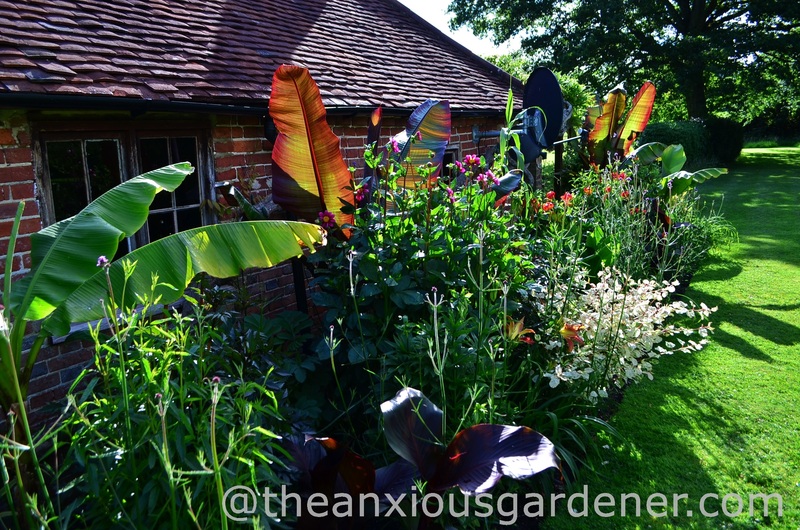 The tropical border looks fantastic already, your compost works magic on those bananas. I bet this fall you’ll need three helpers to lug them in! The satellite dish is a nice touch. 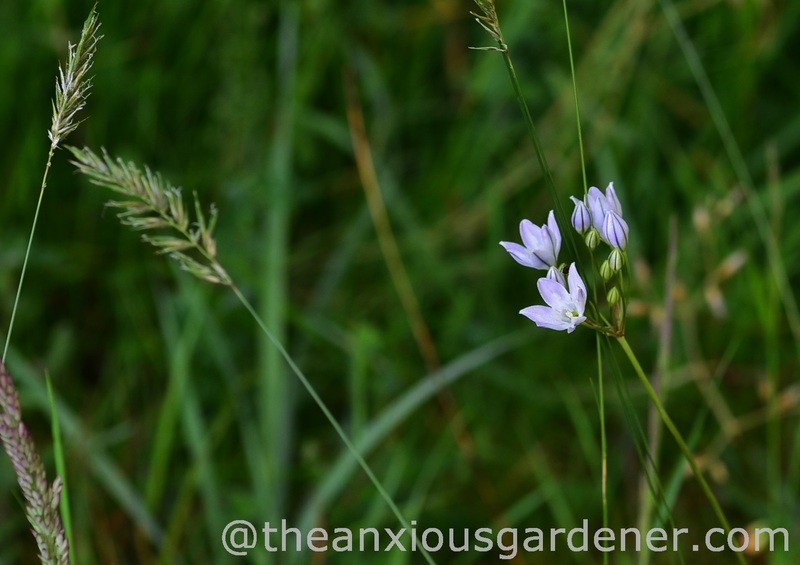 Could your mystery bulb be a tritelia? They usually have more blue though, so probably not. I’ll gladly take the star, but didn’t mean to rub open wounds. My jealous eyes were searching for absolutely anything which might even suggest imperfection at the priory! The assault with “digging-fork, spade, mattock, bow-saw and grin” sounds like the stuff of epics. I hope you’ll have a soundtrack worthy of your efforts to go with it! Five years already — wow. The gardens look amazing. I remember when you started blogging, you were still trying to overcome the Years of Neglect and fill up those beds. Hard to believe now. A gardener’s work is never done. But yours looks lovely and you take beautiful pictures. Glad I’m not the only one who wonders if the insect or his/her relatives will bear a grudge after I’ve bothered or even swatted them. Hello Cynthia, thanks. Glad you like the garden. 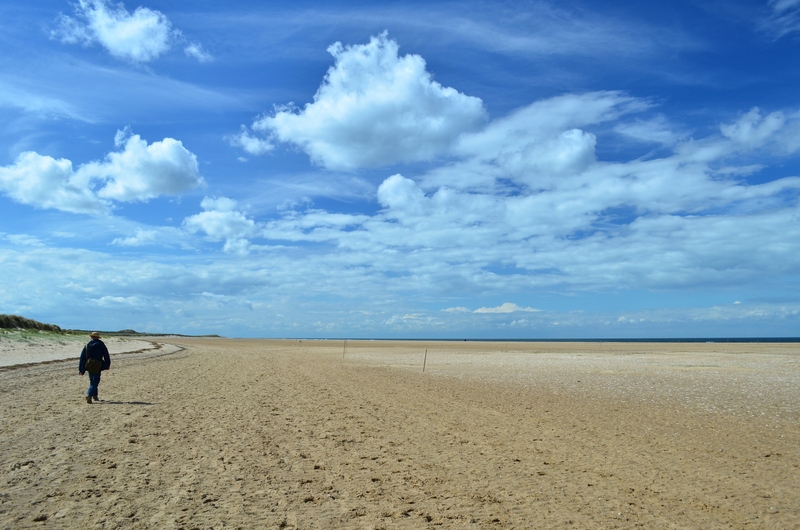 It is increasingly looking parched now – we have had virtually no rain in the last few weeks but still loads of wildlife, grudge-bearing or not. D.
I just saw a dragonfly, their head is about the same shape as your beast so maybe…..
Those baby frogs, how cute! Not too sure about the mysterious bug though! 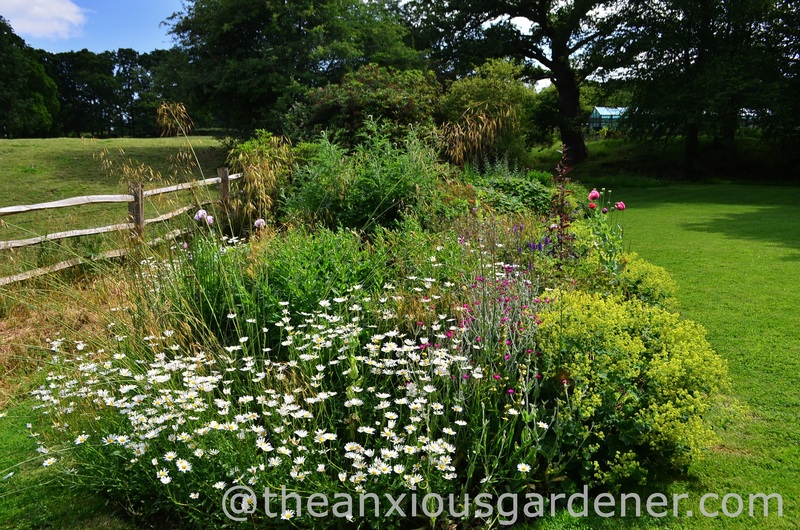 Looking forward to seeing what changes you will bring to the kidney shaped border! The thought of digging up all the plants sounds like jolly hard work, enough to bring on my palpitations. 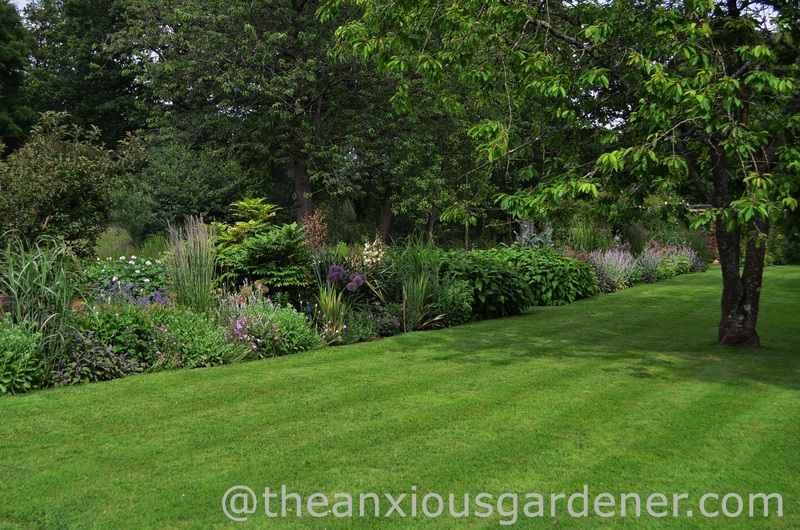 The borders are looking lovely though – even if they don’t come up to your high standards. 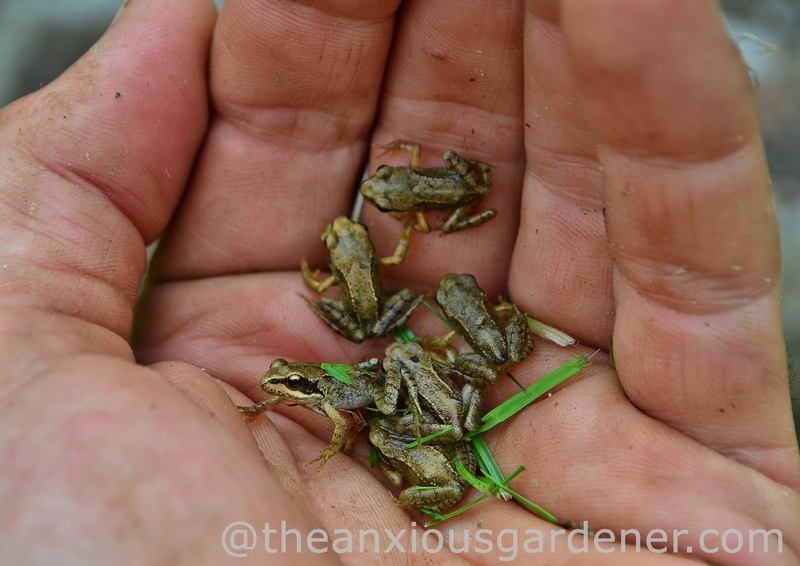 The froglets are delightful – quite a handful. 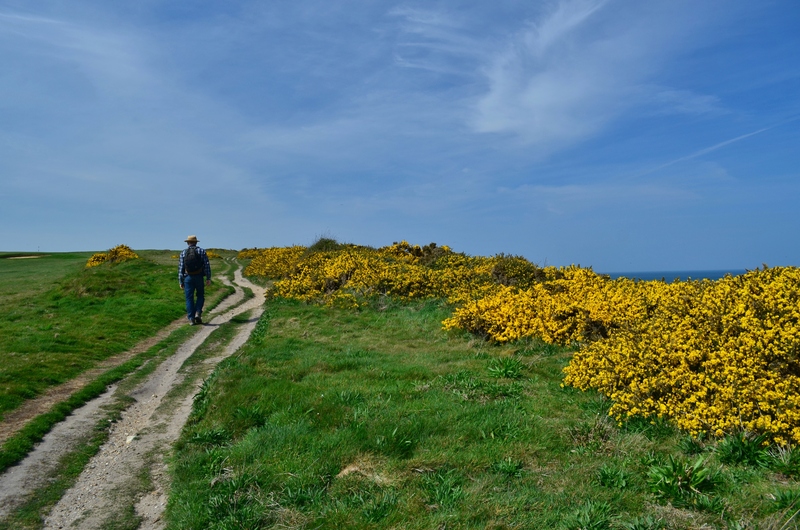 Everywhere is looking wonderful to my eye, but that is the problem with being a gardener – we are never satisfied and just have to keep moving things around. Looks like you have a pretty hefty task ahead this autumn. Those baby frogs are adorable and really remind me of when I was a child and we used to have tadpoles in our garden pond. I get bigger frogs in our garden from a neighbours pond, but rarely see them that small any more. 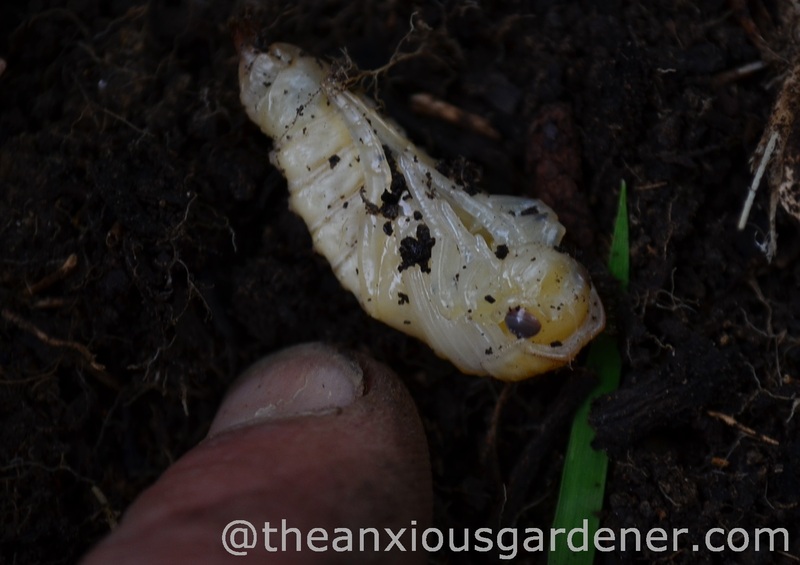 Don’t know what the beast is although I found something very similar looking in my flower bed this time last year. Ugly bugger. Lovely frogs though.